We loved our time in Lucignano 2 and particularly the large wood burning fireplaces. There were 2 but we were drawn to the one in the large country kitchen. We also enjoyed having an outdoor grill so we could do our own steak Florentine. In fact we had dinners at the Villa every night and explored the wineries, hill towns and Sienna. Our hosts were gracious and helpful. We very much enjoyed our stay and hope to return to this beautiful area again. Thank you Duccio for bringing us more wood! I rarely write reviews and am very selective about using superlatives, but this is an exception. This villa and its owners are simply the best. The house and grounds are gorgeous and immaculately kept. Though I enjoyed the villa with just one other couple, this house could easily accommodate 4 couples or more and still feel spacious. 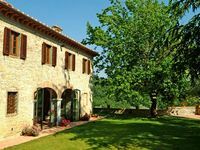 With a wood fired pizza oven, wood grilling fireplace, and well stocked kitchen, the villa is a dream for Tuscan cooking at home if that is your thing. 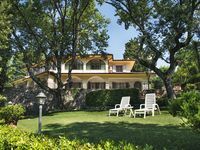 But the absolute best thing about Villa Tre Querce is the incredible kindness and hospitality of its owners, and their constant efforts to assure that every detail of your stay is enjoyable. An evening with Manlio at the helm of the wood fired pizza oven is a must have experience, and his friendliness and charm are incredible. Chiara is likewise charming, accommodating, and caring. It is hard to imagine better hosts in any respect. This property and these wonderful folks should be the poster child for VRBO worldwide. You guys rock!! Thanks isn't saying enough, and we loved every minute of your hospitality.